This is “Estate Planning: Wills, Estates, and Trusts”, chapter 14 from the book Legal Aspects of Property, Estate Planning, and Insurance (v. 1.0). For details on it (including licensing), click here. 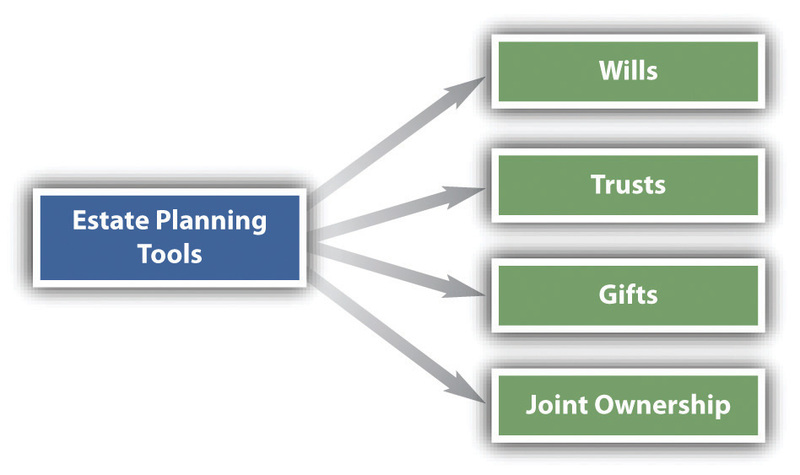 People have at their disposal four basic estate planning tools: (1) wills, (2) trusts, (3) gifts, and (4) joint ownership (see Figure 14.1 "Estate Planning"). The rules governing gifts are discussed in Chapter 9 "Introduction to Property: Personal Property and Fixtures", and joint ownership is treated in Chapter 11 "The Nature and Regulation of Real Estate and the Environment". Consequently, we focus on the first two tools here. In addition to these tools, certain assets, such as insurance (discussed in Chapter 15 "Insurance"), are useful in estate planning. 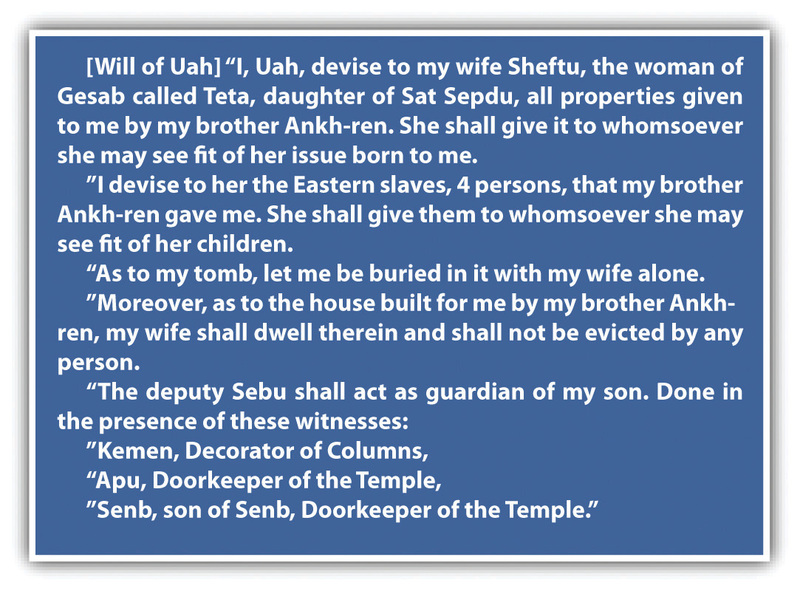 A willThe declaration of a person’s wishes (the testator) about the disposition of his assets on his death. is the declaration of a person’s wishes about the disposition of his assets on his death. Normally a written document, the will names the persons who are to receive specific items of real and personal property. Unlike a contract or a deed, a will is not binding as long as the person making the will lives. He may revoke it at any time. Wills have served their present function for virtually all of recorded history. The earliest known will is from 1800 BC (see Figure 14.2 "An Ancient Will"). Even if somewhat different in form, it served the same basic function as a modern will. Any person who is over eighteen and of “sound mind” may make a will. One who is insane may not make an enforceable will, although the degree of mental capacity necessary to sustain a will is generally said to be a “modest level of competence” and is lower than the degree of capacity people must possess to manage their own affairs during their life. In other words, a court might order a guardian to manage the affairs of one who is mentally deficient but will uphold a will that the person has written. Insanity is not the only type of mental deficiency that will disqualify a will; medication of a person for serious physical pain might lead to the conclusion that the person’s mind was dulled and he did not understand what he was doing when writing his will. The case Estate of Seymour M. Rosen, (see Section 14.4.1 "Testamentary Capacity"), considers just such a situation. Continental Bank & Trust Co. v. Country Club Mobile Estates, Ltd., (see Section 14.4.2 "Settlor’s Limited Power over the Trust"), considers a basic element of trust law: the settlor’s power over the property once he has created the trust. Trusts are divided into two main categories: express and implied. Express trusts include testamentary trustsA trust made during the settlor’s life that takes effect on his death. and inter vivos (or living) trustsA trust that takes effect during the life of the settlor.. 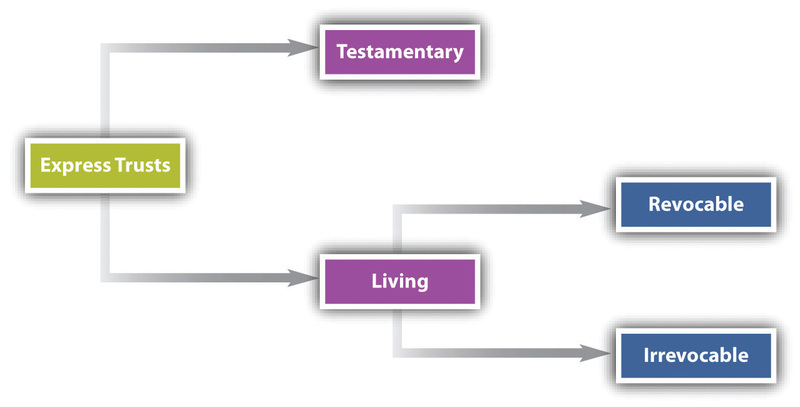 The testamentary trust is one created by will. It becomes effective on the testator’s death. The inter vivos trust is one created during the lifetime of the grantor. It can be revocable or irrevocable (see Figure 14.3 "Express Trusts"). In addition to their use in estate planning, express trusts are also created for business purposes. The business trust was popular late in the nineteenth century as a way of getting around state limitations on the corporate form and is still used today. By giving their shares to a voting trust, shareholders can ensure that their agreement to vote as a bloc will be carried out. But voting trusts can be dangerous. Agreements that result in price fixing or other restraints of trade violate the antitrust laws; for example, companies are in violation when they act collusively to fix prices by pooling voting stock under a trust agreement, as happened frequently at the turn of the century.